Acorn Project began with a risk. After nearly a decade, numerous highly-successful studio and live album releases, over 700 performances on the road touring relentlessly, and appearances at prestigious music festivals and events throughout the West, that risk has proven to be more rewarding than anyone could have imagined. With very little musical boundaries, Acorn Project takes their audience on a unique journey each night. Seamlessly blending deep electro-funk grooves, psychedelic rock, signature soundscapes, and electronic dance music translates to a very unique live experience, one that is filled with the passion brought to the stage at every Acorn performance. That passion is contagious, resulting in the regularly packed houses for this jamtronica act and a high demand tour schedule. The story of Acorn Project only began like so many others. Sam Lax (saxophone/percussion/producer) and Andy Pritiken (lead vocals/rhythm guitar) met in college while studying at Western Washington University in Bellingham, WA. The band was born from basement jam session beginnings in 2004. 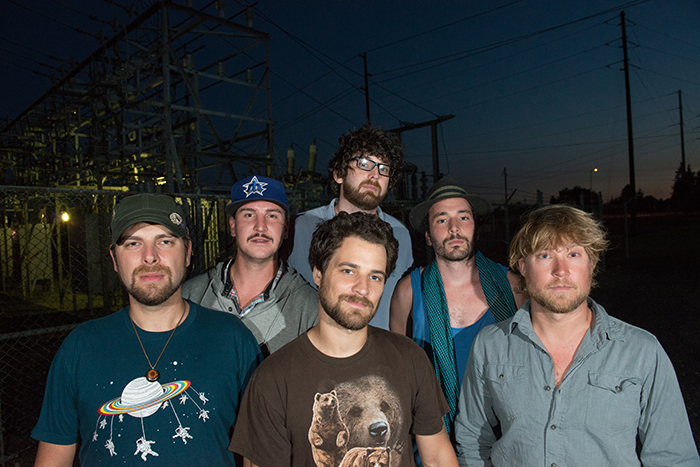 Acorn Project worked fiercely and tirelessly to define their sound locally as a quartet for nearly three years before releasing their first EP Odd His Sleepy Soar in 2006. Following this release, Acorn Project began touring as a Pacific Northwest regional act in an old converted shuttle bus. Two years later, boasting a robust, polished sound, Acorn Project – now a sextet – released their first full-length album, We’ll Be Fine in 2008 to a series of favorable reviews. We’ll Be Fine took home Bellingham’s prestigious album of the year award in the What’s Up Awards and charted at #5 on jambands.com and #4 on CMJ, making Acorn Project the new electro-funk band on every critic’s radar. Acorn Project continued touring feverishly, expanding their region along the West Coast, mountain states, and the Southwest earning devotion from their fans with their addictive live performances and impressive light show. The band has shared billing with names including String Cheese Incident, Widespread Panic, STS9, EOTO, Papadosio, Kyle Hollingsworth, Juno What? !, David Grisman, JGB and Sam Bush. 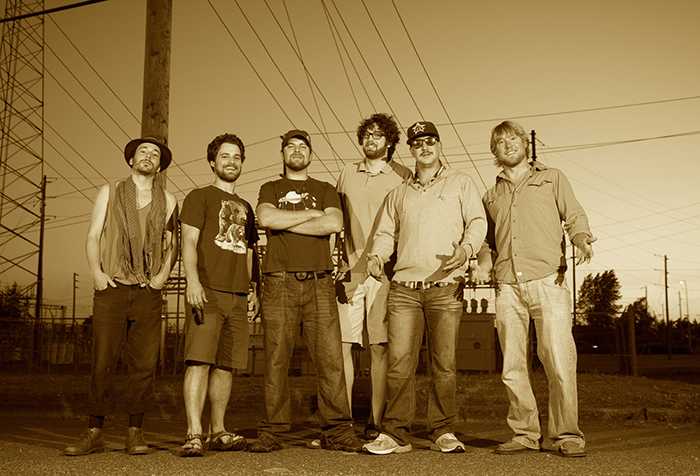 Acorn Project released their sophomore effort, Generation Debt, in 2010, which debuted at #1 on Relix Magazinge and jambands.com national radio chart index, taking home their second album of the year award and continuing their critical acclaim. “Acorn has been working hard to manifest our creative visions as a group for some time now. The current culmination of that vision is felt strongly in our newest album Shift,” says Lax. The eclectic and distinct sound that Acorn Project produces is favorably captured on Shift, the band’s 4th full-length studio album. Following in the footsteps of past studio efforts, the record shows maturation and growth as a band. The new utilization of a tasteful balance of produced beats, audio samples and unique synthesizer tones emphasize their growing love for live electronica music. Throw in a little pop flare with production savvy, and the result is an outstanding collection of material showcasing what Acorn Project has become in Shift. The current arrangement boasts talented players that are thirsty to work toward a collective vision. Danceable beats performed by the virtuous rhythm section comprised of Kevin Chryst on drums and Scott Vaillancourt on bass are infectious. Together they lay the foundation for addictive hooks, melodic progressions, and dynamic leads performed by Oskar Kollen on keyboards and synths, Acorn’s characteristic tone found in Lax on saxophone, and newly-joined Samuel Eisen-Meyers’ calculated, inimitable and emotionally driven style on lead guitar. Thought provoking vocals written and performed by Pritiken tie it all together telling stories and twisting riddles with hidden meanings left to the listener’s interpretation. In the past several years Acorn Project have appeared live at numerous music festivals including Earthdance (California), Sonic Bloom (Colorado), String Cheese Incident @ Horning’s Hideout (Oregon), Summer Meltdown Festival (Washington), Telus Live @ Whistler (BC), Seattle Hempfest, and Eugene Celebration amongst many others including their own successful annual festival productions WONK and UMF at home. Now with over 700 performances and a fervent fanbase in major U.S. markets like Seattle, Portland, Denver and San Francisco, Acorn continues to grow into a mighty oak from deeply seeded roots. Up and coming, always on the brink, Acorn Project is focused on establishing themselves as a national touring act while continuing to spawn a forward thinking and conscious movement amongst the community in their wake. Look for Acorn Project’s third studio album, Shift, available September 2013. Sam Lax – Saxophone, electronic percussion, laptop production, vocals. Andy Pritiken – Rhythm guitar, lead vocals. Oskar Kollen – Keys, vocals.